Back at the ski show with yet another competition! 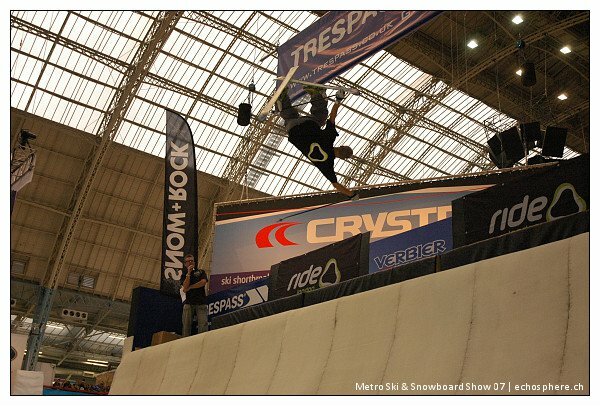 Welcome back to the Metro Ski &amp; Snowboard Show in London. In the last article we almost got all geared up for a holiday booked at the show. Once this is done, there are a few more exhibits to visit, such as the Brands arena. 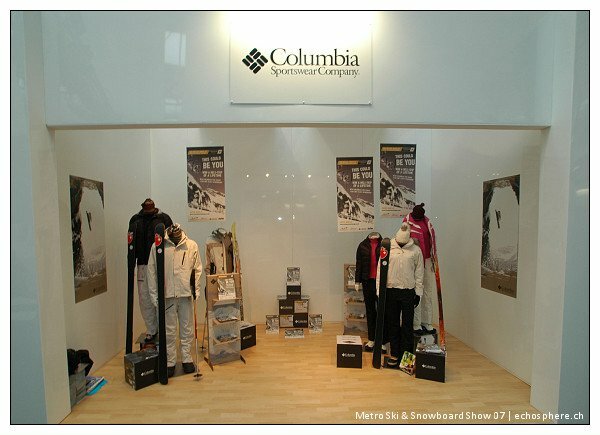 There you will find Columbia, Burton, Rossignol to name a few. The stands are actually quite small since there is no need to show all the gear. The retailers take care of that. So what do the brands show there? They usually highlight a selection of their newest gear and display it. Bonfire thought it would be cool to do an autumn theme and covered the floor of their booth with dead leaves. Most of the brands, however, have a much more classical display. Mostly it is about showing that they are here and to refer visitors to the retailers present in order to buy the products on display. The Columbia stand. As you can see, there isn&rsquo;t much since all the gear was being sold on other stands. Photo: Oliver Maccabez. The Salomon SPK boots. Photo: Oliver Maccabez. 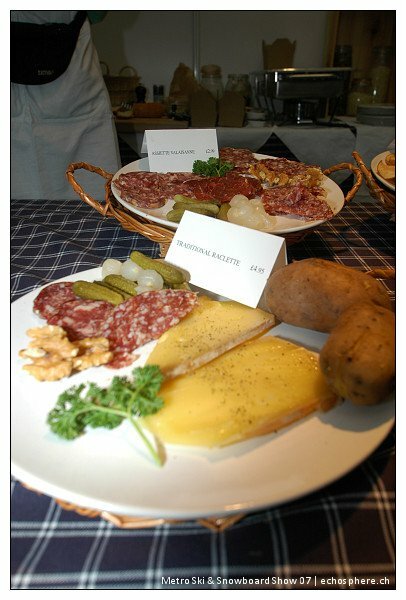 A platter of raclette, typical dish from Switzerland and some parts of France as well. Photo: Oliver Maccabez. Rider Flo Wieser interviewing a guy who looked an awful lot like Merlin the enchanter. Photo: Oliver Maccabez. 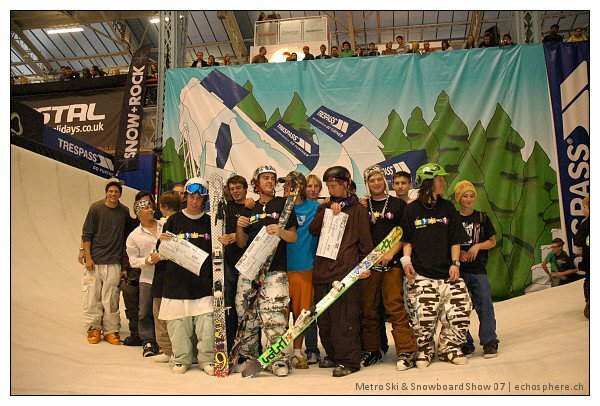 But, the Metro Ski &amp; Snowboard Show doesn&rsquo;t stop there. You may want to stick around for the fashion show, displaying the latest equipment from the brands present at the show. 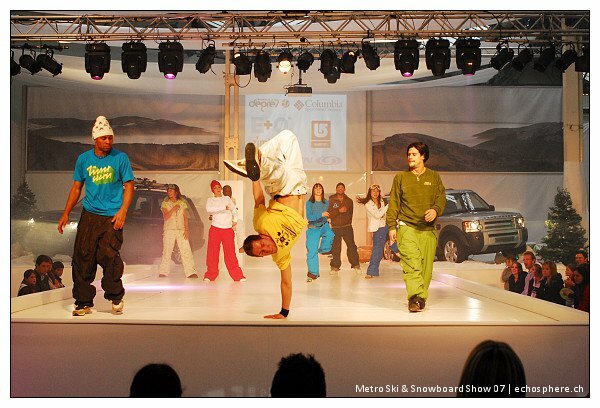 This, however, is not just any fashion show; it&rsquo;s mixed with quite a bit of break-dancing. If you&rsquo;re patient enough and stick around through the end, there&rsquo;s even free stuff being thrown out into the crowd. The fashion show with loads of cool moves. Photo: C&eacute;dric D&ouml;rig. After sitting on a backless bench during the whole show, your back has to be feeling a bit sore&hellip; Don&rsquo;t worry though, the Show also has masseuses placed in a few key areas and helping people get their relax on. This comes at a really cheap pay-what-you-think-it-was-worth flat rate &ndash; if only the mobile phone companies worked this way&hellip; Right after that it&rsquo;s about time to get a souvenir from the show &ndash; and by that we don&rsquo;t mean all the gear you&rsquo;re already hauling through the alleys with you. You can get that at the Metro VW Van &ndash; especially pimped out for the occasion &ndash; wearing retro ski gear from the flashy 70s and 80s. Even the organizers tried it out, but those pictures are confidential for now! Once your picture is safely put away in your back pocket, you can move on to the gigloo. What in the world is a gigloo? It&rsquo;s a new word for sure, created from gig and igloo. That&rsquo;s right, a gig in an igloo. Of course, since there isn&rsquo;t any snow about, the igloo is actually a tent in the shape of an igloo. In there you have a small stage where many bands are playing one after the other and some space for the public. When there is no band performing, the gigloo is also being used as a break dancing center where the young can go learn a few tricks of the trade. 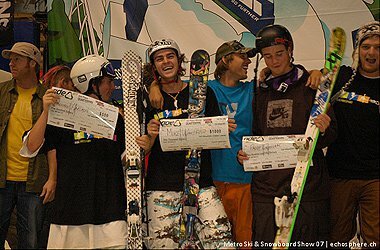 While the kids are doing that, you are enjoying a small conference about freeride photography or improving your tricks in the Snowboard &amp; Freeski theatre with quite a few well-known speakers. Now that the children are done with their break dancing, you can take the whole family to the EasyJet ice rink to go skate. However, skating in a circle can get boring very quickly, so you can choose between an urban art gallery to check out a few artists from the UK doing their thing on a white wall or freshen the kids&rsquo; skiing skills at the teaching slope. Some really sick art. We watched as it was being painted! Photo: Oliver Maccabez. Don&rsquo;t think for one second that you can&rsquo;t go on there as well, there are people in this world who are over 10 and have never skied before! 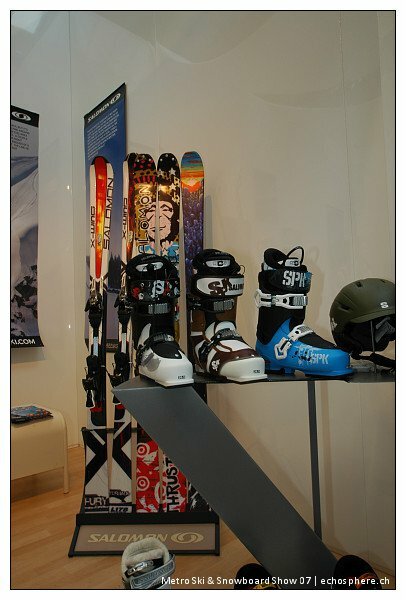 The slope is, as all the slopes used by the pros at the show, built out of snowflex. You&rsquo;ll have to work twice as hard, too, because there is no lift taking you to the top, it&rsquo;s all about going back up wearing your skis and using the special grip surface provided &ndash; it&rsquo;s painted in black, so you don&rsquo;t confuse it with snow and start wondering why this particular brand is so popular even when it doesn&rsquo;t glide at all. 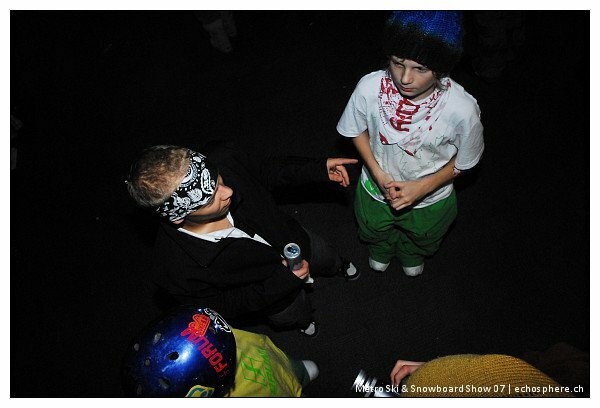 Rider Flo Wieser hangs out with a few of the many kids around. These guys were riding the quarter pipe and are the future champs. Photo: Oliver Maccabez. The day you choose to go to the Show is very crucial! Of course, the weekdaya were quieter, you have more space in the alleys, the lines for the food stands or to sign up for the teaching slope aren&rsquo;t very long&hellip; But, there is one major disadvantage to any day that is not Saturday: there is no London Ride taking place! 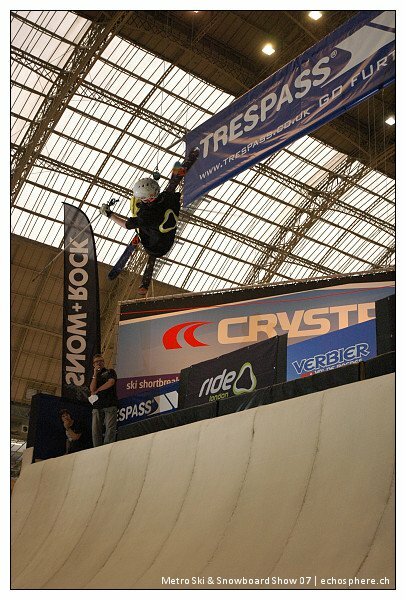 The London Ride is part of the Ride.Freesport series which is composed of six events &ndash; not all of them skiing competitions &ndash; taking place in London obviously, and around Switzerland. 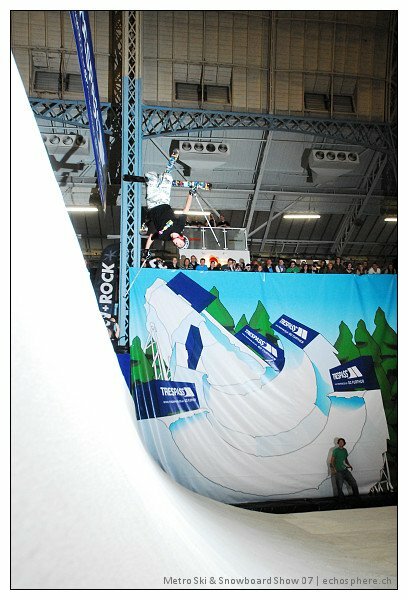 The London Ride is the urban competition of the series, and therefore the only one using snowflex. 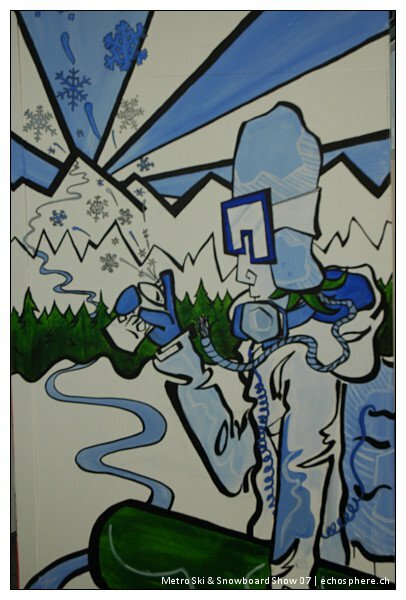 The rest of the skiing comps &ndash; there is also a film festival &ndash; take place on real snow and in the good old Alps. There are always quite a few well-known international riders showing up for these comps &ndash; Henrik Harlaut won the Saas Fee Ride this summer, for instance &ndash; but this competition sticks it to them since the surface is unusual to them. This is the home terrain for the Brits, and they don&rsquo;t hesitate to let the others feel the pain! At last years&rsquo; London Ride, the finals were fully packed with the home crowd, as none of the international guys made it. This however, has changed. Next to the by now quite familiar names of Andy Bennett, Paddy Graham, Mike Wakefield and many more British riders, you could find Flo Wieser from Austria, Gilles Vetsch, Martin Robin and Fabian Kr&ouml;nig from Switzerland, and Henrik Harlaut from Sweden trying to show what the rest of Europe can do. As last year was dominated by the Brits, this year saw all of the international riders making it to the finals and one of them even to the superfinal. Warren Smith, the event director of the London Ride. Photo: David Fay. The competition is quite standard when it comes to the structure: qualifications first, finals and then superfinals. Of the 24 riders starting, 14 make it to the finals and only three to the superfinals. 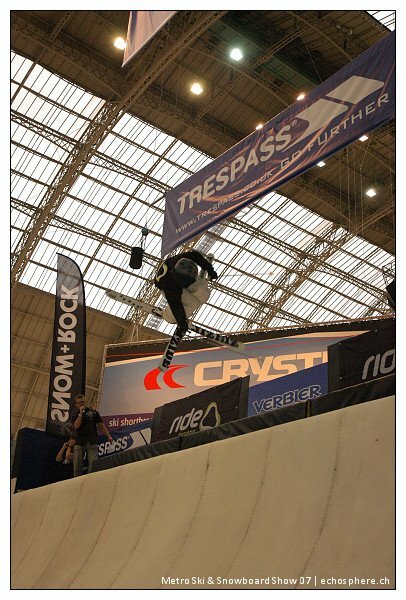 James Woods got into the finals with very technical jumps. Photo: C&eacute;dric D&ouml;rig. Two runs each and the best of both counts for the qualifications and the finals, the superfinal only gave the riders one shot. The tricks kept getting better and better with the Brits showing the others how to get some serious air in the quarter pipe. Massive flairs, huge 720s with awesome grabs and some really freaky 9s were common place. 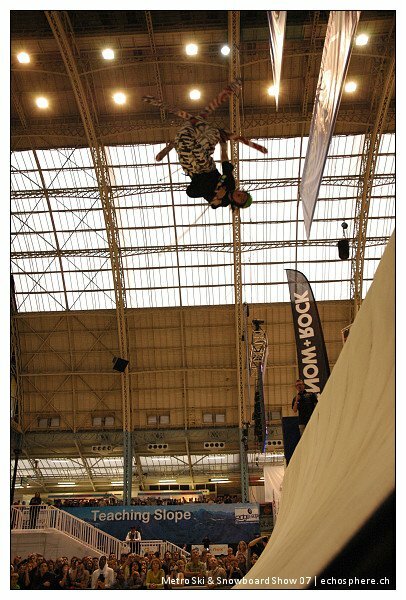 Swiss rider Gilles Vetsch showing a 540 mute. Photo: Oliver Maccabez. Ben &ldquo;Bungle&rdquo; Hawker showing his handplant. Photo: Oliver Maccabez. There was even some talk about a 1080 &ndash; which has never been done before in that environment &ndash; amongst the riders, but it will have to wait for next year. After the qualifications were over, we found all of our international guys making it to the finals with Henrik Harlaut and Flo Wieser right behind Mike Wakefield at the top. This is the first time since the London Ride takes place in a quarter pipe that two international guys were able to perform this well. 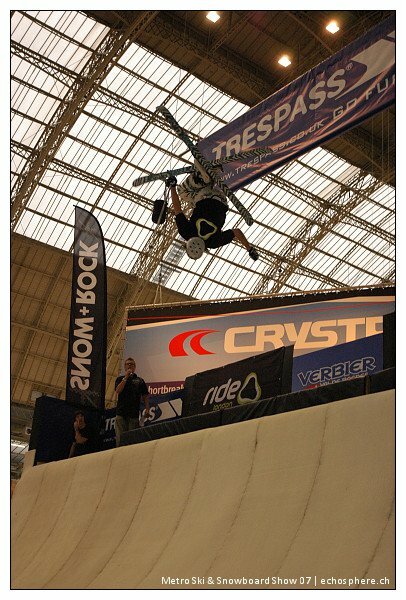 Flo Wieser didn&rsquo;t just interview people around the show for fun, but he actually came to show off his flair tail grab. Photo: Oliver Maccabez. The level was just really high for everyone participating. Photo: Oliver Maccabez. Of course, Mike Wakefield&rsquo;s Wake &lsquo;n Bake was still a definite killer that pleased the judges. The finals saw everything getting mixed up. 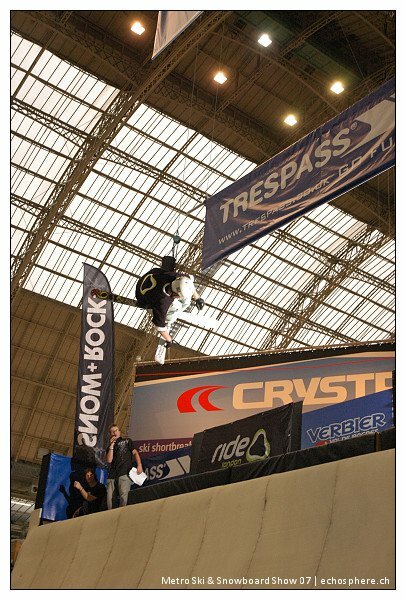 Flo Wieser tried two 9s which he had trouble landing and got kicked off the top three list. Mike Wakefield was taken down from his throne as Henrik Harlaut took the lead. 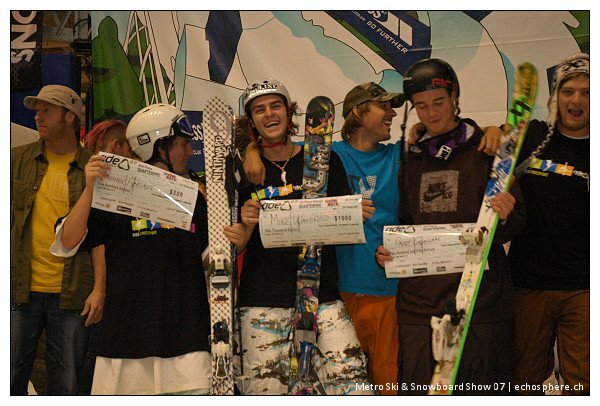 Top three were Henrik Harlaut, Mike Wakefield and Paddy Graham. These are the guys who would compete for the glory. 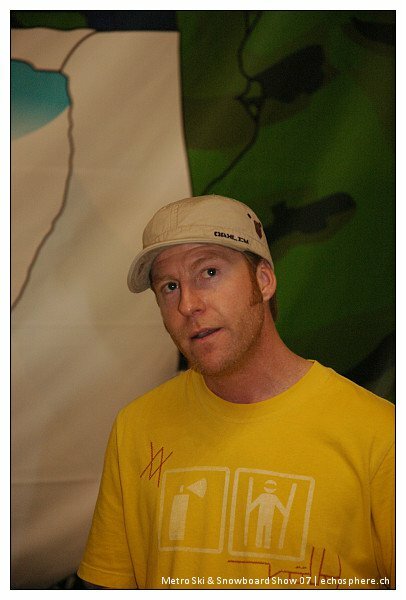 Henrik Harlaut, one of the three last men standing. Photo: Oliver Maccabez. Mike Wakefield again with his now famous Wake &lsquo;n Bake. Photo: Oliver Maccabez. The superfinals just messed up the order all over again, with Mike Wakefield&rsquo;s usual signature trick going smooth as silk from beginning to end. The judges and the crowd just couldn&rsquo;t believe it and he was ranked accordingly. So Mike did his thing and won again, twice in two days. Henrik took the second place and Paddy found it really cool to be third &ndash; more in the V&ouml;lkl Team and Henrik Harlaut interviews below. The crowd went wild to congratulate the winners and to thank every single rider for the amazing show. James Woods was always going really high with his jumps. Photo: Oliver Maccabez. Henrik Harlaut was feeling really good on the surface, even though it was his first time riding on snowflex. Photo: Oliver Maccabez. Mike Wakefield&rsquo;s winning Wake &lsquo;n Bake. Now that the London Ride is over, there was a reason to celebrate for everyone. So, the Hilton nearby hosted the London Ride unofficial party. All the riders, team managers, staff of the London Ride just converged to the bar and enjoyed a nice cold beer or any other drink and proved that they&rsquo;re all just a big family. For very understandable reasons, no interviews were taped in the course of that evening, but we can confirm that lively conversations took place in every corner of the room. All the riders in one shot after the comp. The crowd was really going wild! Photo: Oliver Maccabez. The winners of the London Ride 2007, Henrik Harlaut (2nd), Mike Wakefield (1st) and Paddy Graham (3rd). Photo: Oliver Maccabez. 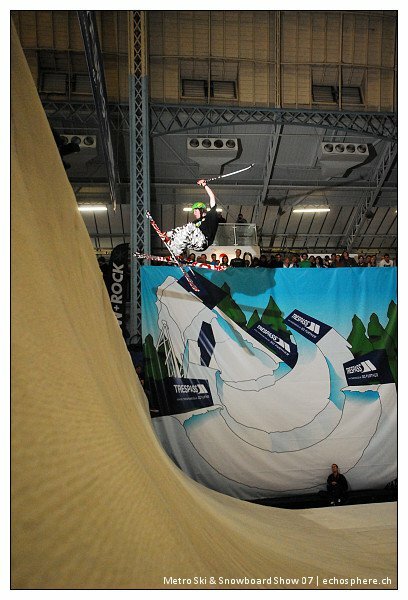 The Metro Ski &amp; Snowboard Show closed its doors Sunday evening &ndash; about the time when yours truly was finishing this article &ndash; and will be on again next October. 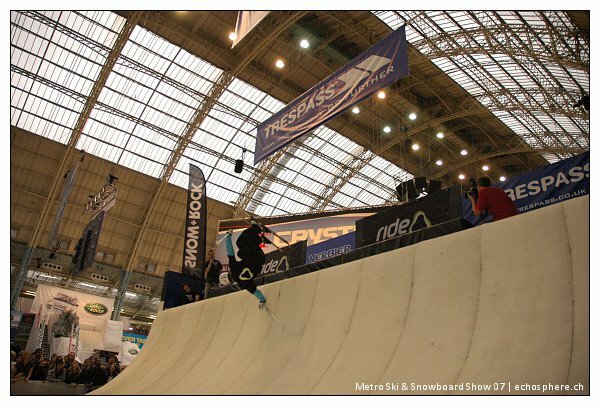 If you want to keep a lookout for the dates of next year&rsquo;s Show, be sure to check http://www.metrosnow.co.uk. For more film footage, be sure to tune in to the organizers of the London Ride&rsquo;s program on TV stations worldwide as well as on their website, http://www.thelondonride.com. The second part of the show and a lot of highlights from the London Ride. 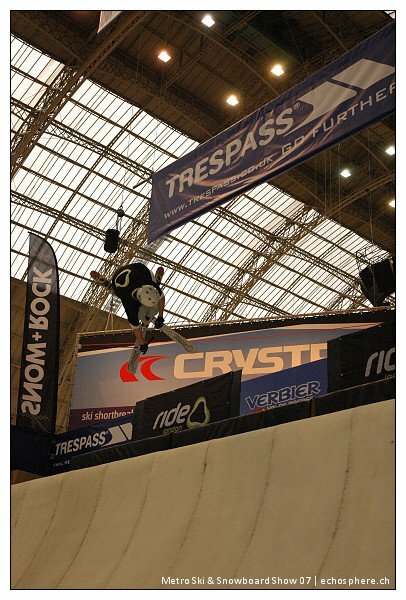 An interview of Damian Norman, the manager of the Metro Ski &amp; Snowboard Show, where he tells us about skiing in the UK. A short interview of the members of the international V&ouml;lkl team present at the event with Warren Smith, Paddy Graham, Flo Wieser and Alex Zica.